Darian Richards is a lost man. A man he has hunted for years has vanished again, presumably overseas. His lover is gone. The Noosa River, the one bank of water that affords him peace, is not doing its job. Early retirement is looking like it is not for him. But then: a visitor to the cabin he has retreated to. Victorian Police Commissioner Copeland Walsh – nicknamed Copland for his dedication – asking for his help. He needs to retire, and be replaced. But his replacement, Nick Racine, has a cloud over his past, involving an unresolved death of an 18-year-old woman in 1990. The case needs closing, and Richards, no longer part of Melbourne’s police politics, is the one for the job. Of course, Darian says yes, as he always will to Copland, the man who made Darian into the police officer he is today – decent and dedicated to justice beyond everything else – he always will. And after summoning Queensland Senior Constable Maria Chastain and unstoppable tech whiz Isosceles, Darian will find out what happened to Isobel Vine: for the outgoing and incoming commissioners; for Isobel’s father, still fighting every day to prove his daughter did not kill herself; and for his own sanity. Cavanaugh’s writing is tight as a clenched fist, and this book is late-night tension, knife-edge danger, pulsating anxiety in your fingers when you turn the page. For every moment that slips out of realism – when Darian’s best friend and Maria’s lover, the slightly criminal yet perpetually honest Casey Lack stumbles around on the page, or when Isosceles manipulates the internet so effortlessly – you are more than paid back in Darian’s dogged pursuit of Isobel’s last few hours, spent in the company of far too many bad people. Often, when I read crime novels, I’m repulsed and horrified and appalled, frequently swimming through a mire of emotions about the bad things people do. Sometimes, there is enough distance between a victim and a reader that when someone in the pages cracks a joke, I can laugh at it. But I can’t remember the last time I cried in a crime book – and I cried in this, for Isobel. I was horrified, too, of course. The world is not always a lovely place. This fictional world, though, is almost a tangible one. Melbourne is a vivid map in this book, but not the kind you’d pass to tourists: everywhere Darian travels, he remembers which crimes he was solving there, the streets of Melbourne hiding a bloodthirsty history. Lygon Street gets a mention, but don’t expect to be flattered by it. 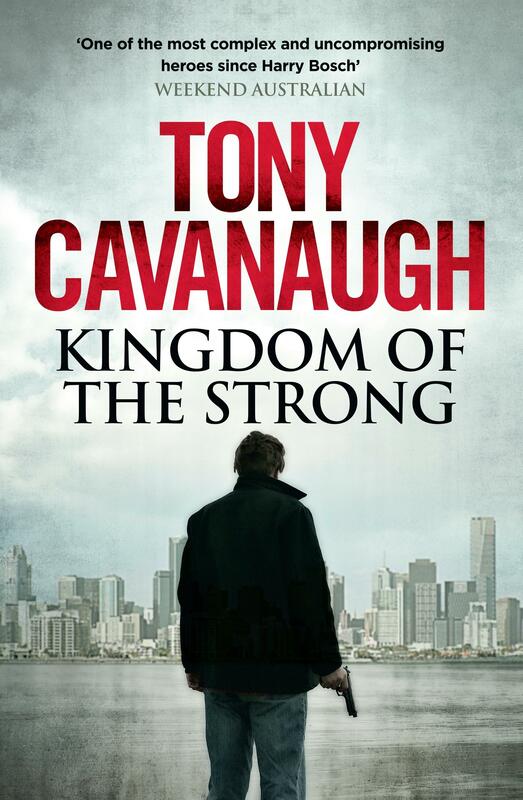 Kingdom of the Strong is devastating; gather your strength and read it.